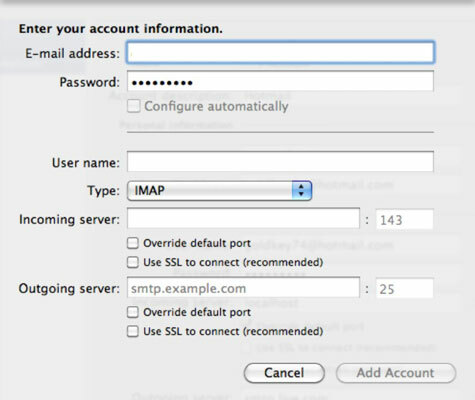 The Welcome screen in Outlook 2011 for Mac has an Add Account button. If you click the button, you start with an empty Identity and add the first e-mail account to the Identity. If you already have an e-mail account within an Identity, you can add more accounts, one at a time. You may be pleasantly surprised by how easy it is to add an e-mail account to an Outlook Identity in Outlook 2011. Microsoft has gathered the settings for a large number of popular e-mail providers so that in many cases, all you have to do is enter your e-mail address and password, and Outlook takes care of the rest. Of course, before you begin, you should obtain your e-mail address, password, and account settings from your Internet service provider. Click the plus (+) sign in the lower-left corner. Choose E-Mail from the pop-up menu. Enter the e-mail address and password for your e-mail account and then click OK.
As soon as you enter your e-mail address, additional form fields appear, asking you to supply appropriate settings information provided by your Internet service provider. If Outlook knows the settings, they will be filled in for you and the Configure Automatically check box will remain selected. If Outlook didn’t automatically fill in the account settings, fill them in manually. Click the Add Account button to add your e-mail account to the accounts list in the Account dialog.